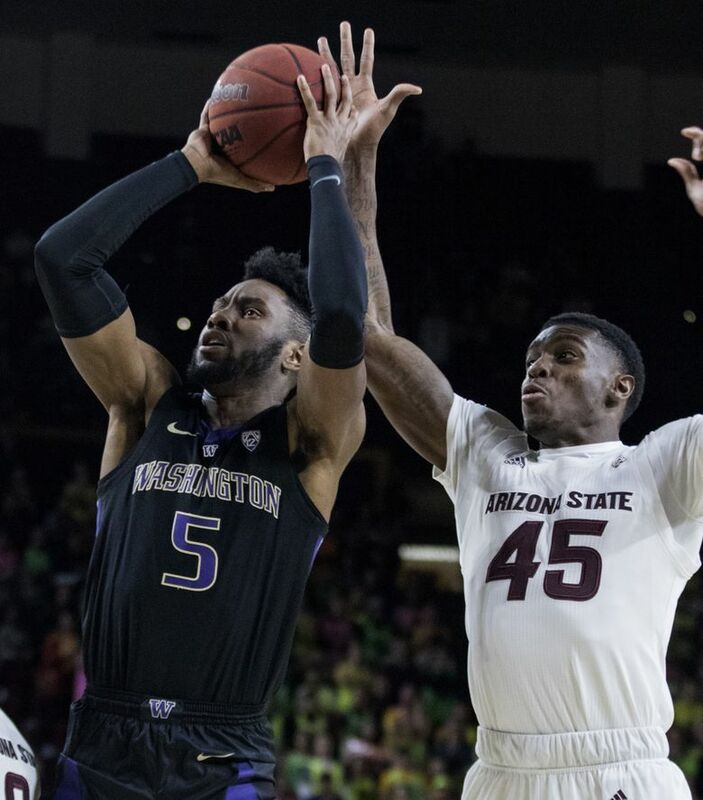 It’s been 56 days since the Huskies lost a game, but they walked off the Wells Fargo Arena court on the wrong side of a 75-63 defeat to the Sun Devils. 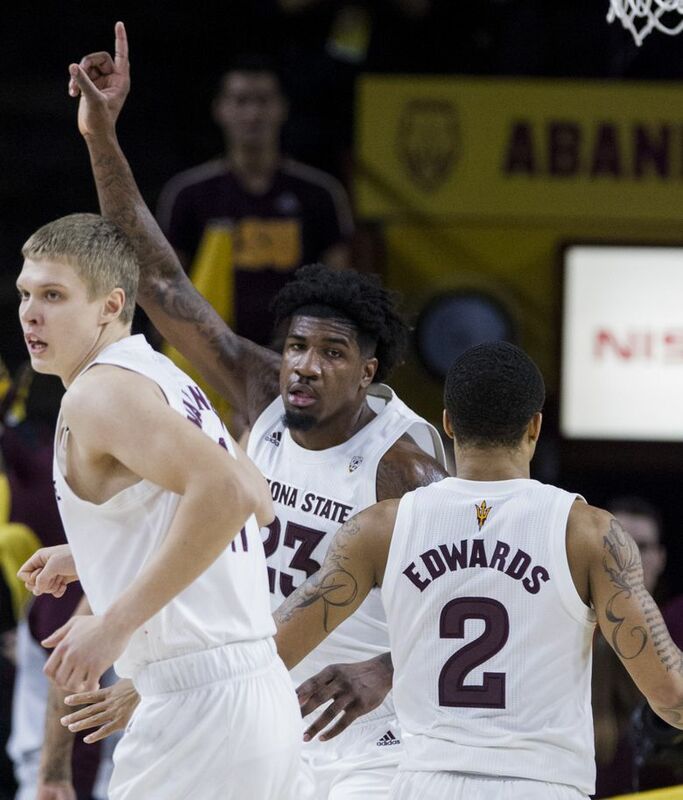 TEMPE, Ariz. – Washington’s bid for Pac-12 perfection and the conference’s first 18-0 season came to a crashing halt Saturday night at Arizona State beneath a flurry of dunks from the Sun Devils. 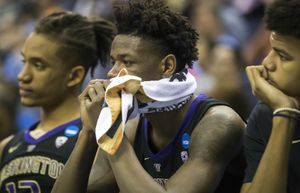 It’s been 56 days since the Huskies lost a game, but they walked off the Wells Fargo Arena court on the wrong side of a 75-63 defeat that snapped their 12-game win streak. “For 12 straight games these really came out and hit first and their energy levels have been great,” coach Mike Hopkins said. “Tonight we just didn’t have that same kick. Sometimes that happens. We tried to find it. We battled. We showed that grit. 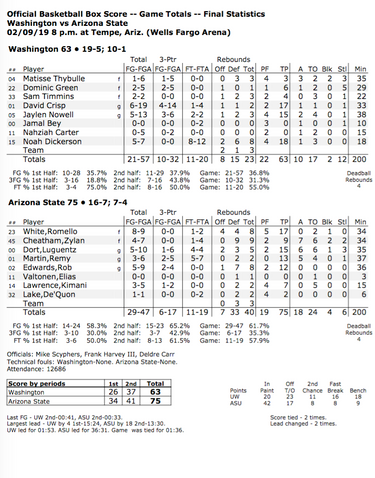 It was a must-win game for Arizona State (16-7, 7-4 Pac-12), which was desperate after losing 91-70 to Washington State on Thursday and in danger of falling out of NCAA tournament projections. 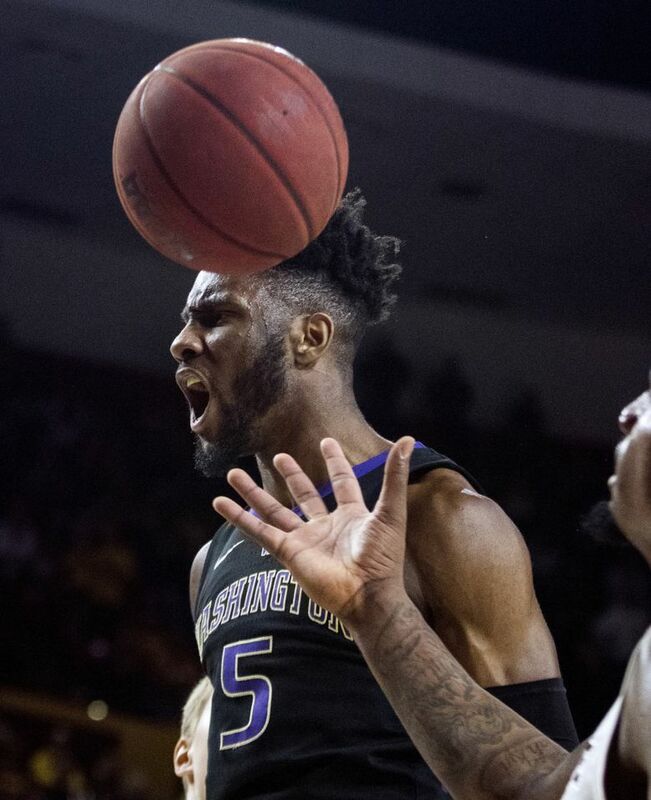 Meanwhile Washington (19-5, 10-1), which captured a 67-60 win at Arizona in its previous outing, was forced to settle for a split this weekend after sweeping its first two conference road trips. During their winning streak that spanned nearly two months, the Huskies forced a slew of turnovers, took away opponents’ perimeter offense and made timely shots from outside. Washington followed a similar script on Saturday night. ASU committed 24 turnovers and converted just 6 of 17 three-pointers while UW hit 10 3-pointers. Even though David Crisp had 17 points and four 3-pointers and Jaylen Nowell chipped in 15 points, this time UW couldn’t squeeze out enough points from an offense that shot just 36.8 percent from the field and 31.3 percent behind the arc. 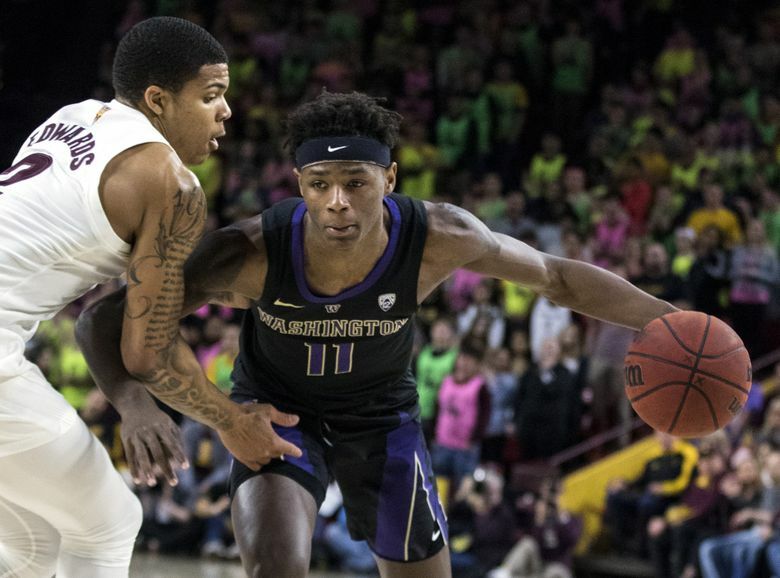 The Huskies also couldn’t withstand a relentless inside attack from the Sun Devils who punished UW with nine momentum-swinging dunks that felt like blows to the midsection. “It really wasn’t about the offense, it was the defense,” said Dickerson, who finished with 18 points and eight rebounds. 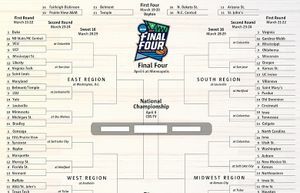 “They were getting to places we don’t normally let teams get to. The Sun Devils outscored the Huskies 42-20 in the paint and 16-8 on fastbreak points. For the second straight game, Hopkins was forced to rely on a makeshift lineup that included guard Dominic Green and forward Sam Timmins in place of Dickerson and Hameir Wright. Dickerson, who is dealing with a sprained right ankle, came off the bench once again. And Wright missed his second straight game due to an illness that affected a few UW players this week. 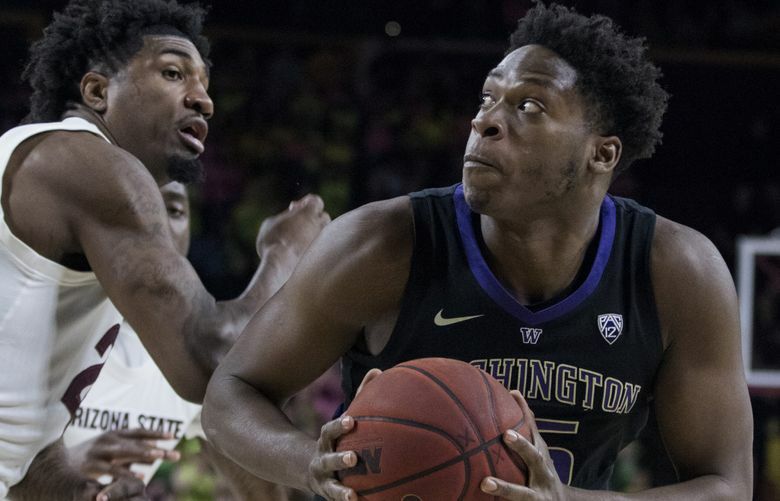 Being shorthanded on the front line hurt the Huskies, who had difficulty keeping Romello White out of the paint. The 6-foot-8 sophomore forward tormented UW with 17 points on 8-for-9 shooting, a handful of dunks and eight rebounds. Cheatham, who had nine points, nine rebounds and seven assists, directed an ASU offense that shot 61.7 percent from the field – it’s third best shooting performance in a Pac-12 game in 13 years. Washington also had difficulty containing guards Luguentz Dort (15 points, six assists and five rebounds), Remy Martin (13 points and five assists) and Rob Edwards (12 points and eight rebounds). “They did a great job – better than any team that we’ve played – of getting the ball in the high post and going high low and really capitalizing inside,” Hopkins said. Buoyed by an energized crowd of 12,686, the Sun Devils jumped out to a 5-0 lead before Washington went on an 11-2 run to go up 11-7. White answered with a pair of dunks during a 9-0 run that put ASU back on top 16-11 and the Sun Devils never trailed again. The Huskies hit just 3 of 16 three-pointers in the first half and went into halftime down 34-26. Arizona State started the second half with a 16-6 run to race ahead 50-32. 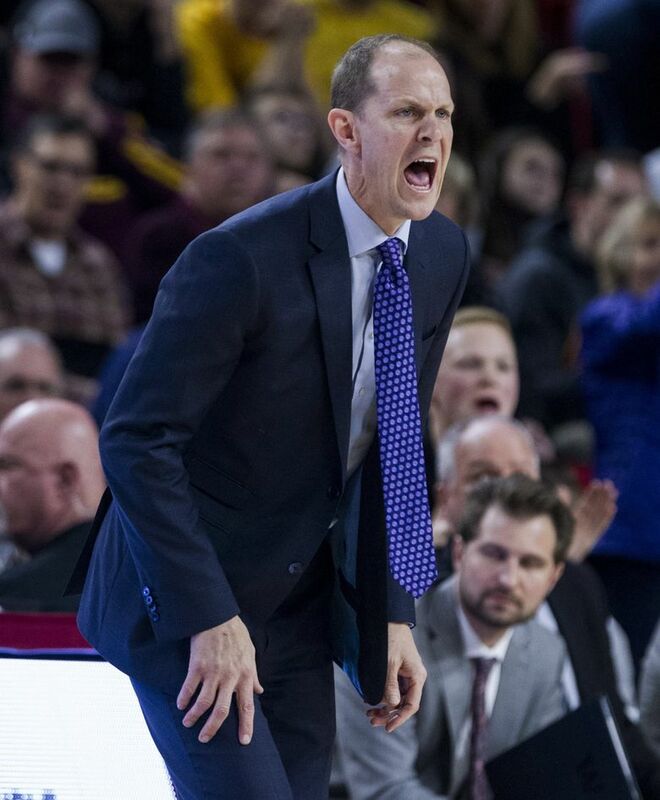 Tensions rose near the end as UW coach Mike Hopkins and ASU coach Bobby Hurley bickered at referees. Both teams combined for 41 fouls. Hopkins, who lamented a 40-23 rebounding disparity, also verbally tore into the Huskies during timeouts. Down 17 points (54-37) with 9:42 left, the Huskies used a 10-0 run to make one last comeback attempt. Dickerson, who was 8 of 12 on free throws, canned two freebies to cut UW’s deficit to seven (54-47) at the 6:29 mark. Washington never got any closer the rest of the way. Cheatham stopped the run with an emphatic dunk that sparked two unanswered baskets and a 16-9 run that pushed ASU’s lead to 70-56 with 1:55 left. 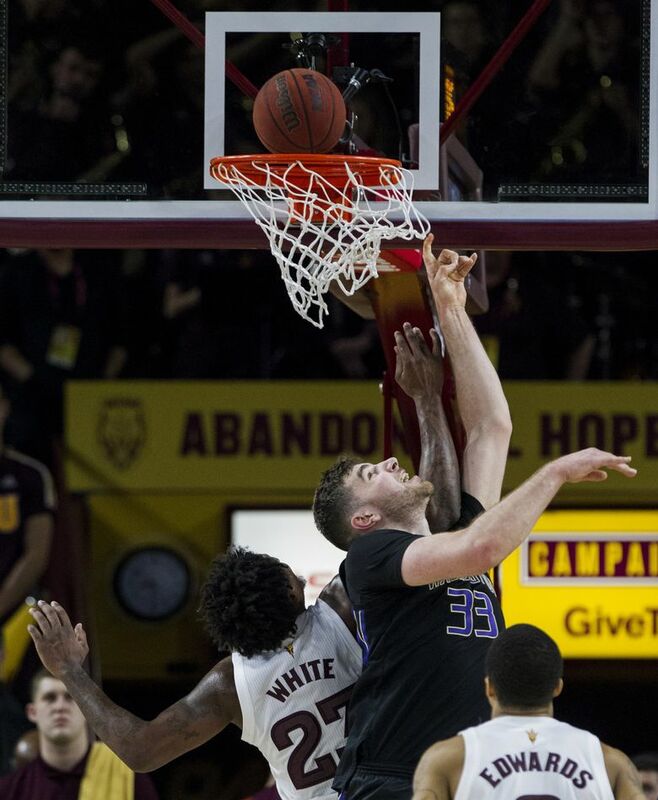 And perhaps fittingly, the game ended with a rim-rattling dunk from Cheatham that sent the Huskies home with their first Pac-12 defeat. UW has a three-game lead in the conference regular-season race over ASU, Oregon State and Utah with seven contests left.